UCLA researchers have discovered that a combination of high doses of radiotherapy and hormonal therapy provides the best chance of decreasing the mortality rate of men with aggressive prostate cancer. The findings also suggest that such a multimodal treatment approach has the best chance of preventing metastatic disease and improving overall long-term survival. The study, led by UCLA researcher Dr. Amar Kishan in collaboration with researchers at 11 institutions across the United States, is the first of its kind to compare treatment outcomes between radiotherapy treatments that are higher than the standard dose and traditional treatments, such as radiation and prostatectomy (the surgical removal of all or part of the prostate gland), in men with cancers that are Gleason score 9 or 10 (the highest score possible). The Gleason grading system is used to help evaluate the prognosis of men with prostate cancer; the higher the Gleason score, the more likely it is that the cancer will grow and spread quickly. "The type of aggressive form of prostate cancer that we focused on has sometimes been regarded as so high risk that some patients even forgo local treatments, like surgery or radiation, because they are worried that the cancer has already spread and is incurable," said Kishan, who is an assistant professor of radiation oncology and member of the Institute of Urologic Oncology at UCLA. "Our findings, in fact, show just the opposite—in this study, the patients with the best outcomes were those who received an aggressive therapy that included so-called 'extremely dose-escalated radiotherapy' along with hormonal therapy." The study builds upon previous research led by Kishan and colleagues, which provided the first evidence that surgery and standard radiation-based treatments offer equivalent treatment outcomes for men with prostate cancer, and suggested a potential benefit over both with radiation treatments in higher than the standard dose. The ideal therapeutic approach for these patients has long been controversial, in part because technologies and radiation-based treatments have evolved significantly over time. The effectiveness of these approaches is of even greater importance for the most aggressive forms of prostate cancer, which are more likely to lead to metastatic disease and eventually death. Several studies have shown that increasing the dose of radiotherapy beyond standard doses (known as extreme dose-escalation), in combination with hormonal therapy, has improved short-term treatment outcomes, but no previous studies have shown a difference in mortality rates or long-term survival in any group of patients with prostate cancer. Previous research comparing patients treated with radical prostatectomy to radiotherapy-based treatments have generally included patients treated over the span of multiple decades. Many of these patients were treated with lower doses of radiation and/or with insufficient hormonal therapy. Kishan's team hypothesized that by using a large pool of patients with aggressive disease treated within a recent time frame, they could better assess the effectiveness of modern treatments in these high-risk patients. In the three-year study, the UCLA-led team analyzed 1,809 men who were treated for Gleason score 9-10 prostate cancer from 2000 to 2013 at UCLA and other sites in the United States and Europe. The findings specifically included advanced prostate cancer patients who were treated since 2000 because the standard of care for these patients has significantly improved over time. The scientists used institutional databases to identify patients and obtained clinical follow-up reports to assess long-term treatment outcomes. Prostate cancer is the most common malignancy among men in the United States. About one man in nine will be diagnosed with prostate cancer during his lifetime, and nearly 30,000 men will die from the disease annually. Identifying the optimal treatment strategies for this malignancy, and in particular highly aggressive forms of the disease, are of vital importance to the public. The treatments received by men included in the study are much more likely to be similar to those being offered to patients at various medical institutions throughout the world today, compared to the treatment methods assessed in previous research studies. 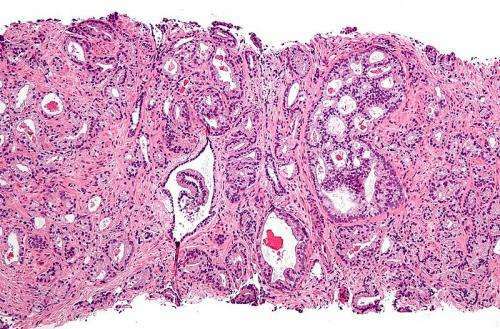 The findings have the potential to help physicians better identify men with prostate cancer who will benefit from a multimodal therapeutic approach and advise patients of the effectiveness of various treatment options.